John Romley, Prodyumna Goutam, and Neeraj Sood leveraged a rapid survey technology to ask a large sample of U.S. adults about their willingness to use a vaccine for Ebola and the effect of out-of-pocket costs and community vaccination rates on willingness during late 2014 when an Ebola epidemic was sweeping parts of the globe. On average, across all survey scenarios (including community vaccination rates and out-of-pocket costs), 51 percent of respondents indicated a willingness to use a potential Ebola vaccine. 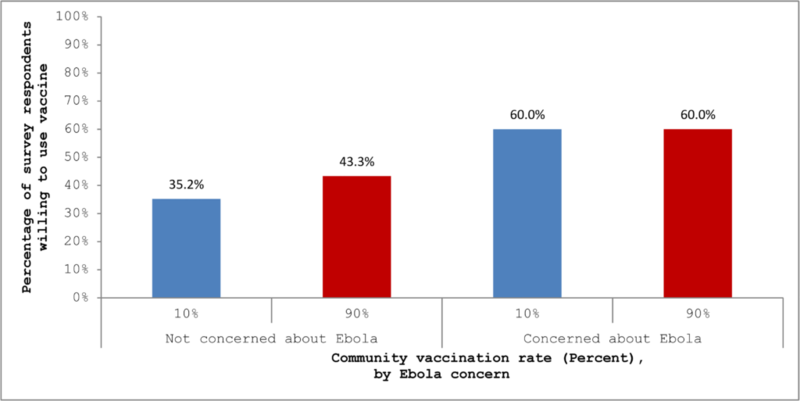 Concern about getting Ebola was an important marker of willingness: 60 percent of concerned respondents would use the vaccine compared to about 35 percent of respondents who were not concerned. Respondents expressed a greater inclination to use the vaccine in a hypothetical scenario with a high community vaccination rate. In particular, an increase in the community vaccination rate from 10% to 90% had the same impact on reported utilization as a nearly 50% reduction in out-of-pocket cost. In recent years, outbreaks of Ebola, Measles, and most recently the Zika virus have made headlines, elevating conversations about whether public health mandates for vaccines are justified for improved community safety. Public policies should take into account motivating factors for individuals. These findings give clear evidence that peer behavior is an important influence in an individual’s willingness to get a vaccine. The full study is available at PLOS ONE. Citation: Romley, J., Goutam, P., & Sood, N. (2016). National survey indicates that individual vaccination decisions respond positively to community vaccination rates. PloS one, 11(11), e0166858.